Treadmills can be fit into a small, out of the way spot in most homes, and even in a few offices. The ability to get your exercise done inside when it is either too hot or cold outside is very nice indeed. The ProForm Treadmill series has various models with different options for different intensities of workouts. Prices can range from $500.00 to $2,000; it just depends on what features you are looking for in the treadmill and the quality that you want. In the lower price and feature range, the ProForm Treadmill outranks the Nordic Track Treadmill and the Fuel Treadmill. 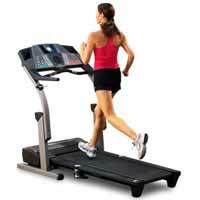 In the mid price range, the ProForm treadmills outranks a host of others in the same price range. In the upper mid range the ProForm treadmill out ranks the Bowflex Tread Climber and many others in the same comparison rating. In the top range the ProForm series once again has models that outpace the competition, as they have commercial grade motors that will self cool themselves as you do longer workouts. The ProForm treadmills offer overall quality and a variety of features for any person at any level of fitness. Some of their more economical models compare favorably with other brands with larger price tags. Ease of assembly cannot be overrated, and overall this is a very easy to assemble piece of exercise equipment, no matter which model you purchase. If you choose, you can also get a component called the “iFit live” which allows you to plan your own workouts and keep track of them along with the help of “helpers” to make sure you are doing the best workout for you. If you want music with your workout, it also has a port for you to put your iPod into, so you can have your favorite tunes or audio books as you get in shape.